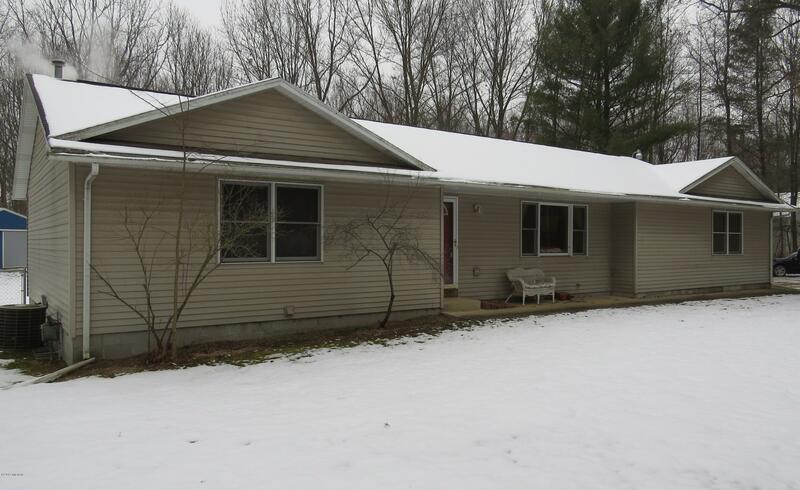 Wonderful, move-in ready ranch with 3 bedrooms, and 2 1/2 baths with beautiful tiled showers, that sits on over 2 acres. Home features almost 1300 sq ft on the main level, and almost 800 sq ft that is finished in the basement with theatre/family room, and a full bathroom. Has a large kitchen with snack bar and eat in area, with doors that lead to the deck. A spacious living room, laundry on the main floor, as well as in the basement, and a mud room off the 2 car attached garage. The basement has lots of additional storage, and more room that could be finished. Surrounded by mature trees, with a large fenced yard, and a 27x24 pole barn. Washer & dryer reserved.